Stephen McDannell Hillenburg (August 21, 1961 – November 26, 2018) was an American animator, voice actor, and marine biologist. He was best known as the creator of the Nickelodeon animated television series SpongeBob SquarePants (1999–), which he also directed, produced, and wrote. It has gone on to become the fifth longest-running American animated series. Born in Lawton, Oklahoma and raised in Anaheim, California, Hillenburg became fascinated with the ocean as a child and developed an interest in art. He started his professional career in 1984, instructing marine biology, at the Orange County Marine Institute, where he wrote The Intertidal Zone, an informative comic book about tide-pool animals, which he used to educate his students. In 1989, two years after leaving teaching, Hillenburg enrolled at the California Institute of the Arts to pursue a career in animation. He was later offered a job on the Nickelodeon animated television series Rocko's Modern Life (1993–1996) after his success with The Green Beret and Wormholes (both 1992), short films that he made while studying animation. In 1994, Hillenburg began developing The Intertidal Zone characters and concepts for what became SpongeBob SquarePants. The show has aired continuously since its premiere in 1999. He also directed The SpongeBob SquarePants Movie (2004), which he originally intended to be the series finale. However, Nickelodeon wanted to produce more episodes, so Hillenburg resigned as the showrunner. He went back to making short films, with Hollywood Blvd., USA (2013). In 2015, The SpongeBob Movie: Sponge Out of Water was released; the second film adaptation of the series, it marked Hillenburg's return to the franchise, wherein he co-wrote the story and acted as an executive producer on the project. Besides his two Emmy Awards and six Annie Awards for SpongeBob SquarePants, Hillenburg also received other recognition, such as an accolade from Heal the Bay for his efforts on elevating marine life awareness, and the Television Animation Award from the National Cartoonists Society. Hillenburg was diagnosed with amyotrophic lateral sclerosis (ALS) in 2017, but stated he would continue to work on SpongeBob SquarePants as long as possible. He died due to complications of the disease on November 26, 2018, at the age of 57. Stephen McDannell Hillenburg was born on August 21, 1961 at Fort Sill, a United States Army post in Lawton, Oklahoma, where his father, Kelly N. Hillenburg Jr., worked for the U.S. military. His mother, Nancy (née Dufour), taught visually impaired students. When he was a year old, the family moved to Orange County, California, where his father began a career as a draftsman and designer in the aerospace industry. His younger brother, Bryan, eventually became a draftsman/designer as well. Hillenburg had no recollection of life in Oklahoma, only of growing up in Anaheim, California. When an interviewer asked him to describe himself as a child, he replied that he was "probably well-meaning and naive like all kids." His passion for sea life can be traced to his childhood, when films by French oceanographer Jacques Cousteau made a strong impression on him. Hillenburg said that Cousteau "provided a view into that world", which he had not known existed. He liked to explore tide pools as a child, bringing home objects that "should have been left there and that ended up dying and smelling really bad." Hillenburg also developed his interest in art at a young age. His first drawing was of an orange slice. An illustration which he drew in third grade, depicting "a bunch of army men ... kissing and hugging instead of fighting", brought him the first praise for his artwork, when his teacher commended it. "Of course, this is 1970 ... She liked it because, I mean, obviously that was in the middle of [the Vietnam War]. She was, I would imagine, not a hundred percent for the war like a lot of people then. ... I had no idea about the implications, really, because I just thought it was a funny idea. I remember that still, that moment when she said, 'oh my gosh, look at that'", Hillenburg elaborated. It was then when he knew he "had some [creative] skill". He asserted that his artistry came from his mother's side, despite his father being a draftsman, noting that his maternal grandmother was "really, really gifted" and a "great painter". In the 1970s, someone took Hillenburg to the International Tournée of Animation at the Los Angeles County Museum of Art. He was "knocked out" by the foreign animated films, including Dutch animator Paul Driessen's The Killing of an Egg (1977). "That was the film that I thought was uniquely strange and that lodged itself in my head early on," he recounted. "I've always been interested in art and making things, but I chose not to go to art school because I thought I needed to do something else. Art was a tough way to make a living. I've always done both. I just kind of figured that the marine biology would be a career and the art would be something I did for my own self-expression." Hillenburg went to Humboldt State University in Arcata, California as a marine-science major. He minored in art, and claimed that "[he] blossomed as a painter in Humboldt." In 1984, he earned his bachelor's degree in natural-resource planning and interpretation, with an emphasis on marine resources. He intended to take a master's degree, but said it would be in art: "Initially I think I assumed that if I went to school for art I would never have any way of making a living, so I thought it might be smarter to keep art my passion and hobby and study something else. But by the time I got to the end of my undergrad work, I realized I should be in art." Hillenburg taught marine biology to visitors of the Orange County Marine Institute (pictured) in Dana Point, California during the mid-1980s. After graduating from college, Hillenburg held various jobs in 1984, including as a park service attendant in Utah and an art director in San Francisco, before landing the job he wanted: teaching children. He hoped to work in a national park on the coast, and eventually found a job at the Orange County Marine Institute (now known as the Ocean Institute), an organization in Dana Point, California, dedicated to educating the public about marine science and maritime history. Hillenburg was a marine-biology teacher there for three years: "We taught tide-pool ecology, nautical history, diversity and adaptation. Working there, I saw how enamored kids are with undersea life, especially with tide-pool creatures." He stayed at the Dana Point Marina and was also a staff artist. Although "[i]t was a great experience" for him, during this period, Hillenburg realized he was more interested in art than his chosen profession. While working there, one of the educational directors asked him if he would be interested in creating an educational comic book about the animal life of tidal pools. He created a comic called The Intertidal Zone, which he used to teach his students. It featured anthropomorphic forms of sea life, many of which would evolve into SpongeBob SquarePants characters—including "Bob the Sponge", the comic's co-host, who resembled an actual sea sponge, as opposed to his later SpongeBob SquarePants character, who resembles a kitchen sponge. He tried to get the comic published, but the publishers he approached turned him down. During this time, Hillenburg also started going to animation festivals such as the International Tournée of Animation and Spike and Mike's Festival of Animation where films made by students from the California Institute of the Arts (colloquially called CalArts) were shown. He determined that he wanted to pursue a career in that field. Hillenburg had planned to take a master's degree in art, but instead of "going back to school for painting", he left his job in 1987 to become an animator. Hillenburg enrolled in CalArts' Experimental Animation Program in 1989. About this decision, he said: "Changing careers like that is scary, but the irony is that animation is a pretty healthy career right now and science education is more of a struggle." He studied under Jules Engel, the founding director of the program, whom he considered his "Art Dad" and mentor. Engel accepted him into the program impressed by The Intertidal Zone. Hillenburg said, "[Engel] also was a painter, so I think he saw my paintings and could easily say, 'Oh, this guy could fit in to this program.' I don't have any [prior experience in] animation really." Hillenburg graduated in 1992, earning a Master of Fine Arts in experimental animation. Hillenburg made his first animated works, short films The Green Beret and Wormholes (both 1992), while at CalArts. The Green Beret was about a physically challenged Girl Scout with enormous fists who toppled houses and destroyed neighborhoods while trying to sell Girl Scout cookies. Wormholes was his seven-minute thesis film, about the theory of relativity. He described the latter as "a poetic animated film based on relativistic phenomena" in his grant proposal in 1991 to the Princess Grace Foundation, which assists emerging artists in American theater, dance, and film. The foundation agreed to fund the effort, providing Hillenburg with a Graduate Film Scholarship. "It meant a lot. They funded one of the projects I'm most proud of, even with SpongeBob. It provided me the opportunity just to make a film that was personal, and what I would call independent, and free of some of the commercial needs," he said in 2003. Wormholes was shown at several international animation festivals, including: the Annecy International Animated Film Festival; the Hiroshima International Animation Festival; the Los Angeles International Animation Celebration; the International Short Film Festival Oberhausen; and the Ottawa International Animation Festival, where it won Best Concept. LA Weekly labeled the film "road-trippy" and "Zap-comical", while Manohla Dargis of The New York Times opined that it was inventive. Hillenburg explained that "anything goes" in experimental animation. Although this allowed him to explore alternatives to conventional methods of filmmaking, he still ventured to employ "an industry style"; he preferred to traditionally animate his films (where each frame is drawn by hand) rather than, for instance, make cartoons "out of sand by filming piles of sand changing". Hillenburg had at least one other short film that he made as an animation student but its title is unspecified. Hillenburg's first professional job in the animation business was as a director on Rocko's Modern Life (1993–1996), Nickelodeon's first in-house cartoon production. He "ended up finding work in the industry and got a job" at the television network after he met the show's creator, Joe Murray, at the 1992 Ottawa International Animation Festival, where Wormholes and Murray's My Dog Zero were both in competition. Murray, who was looking for people to direct Rocko's Modern Life at the time, saw Hillenburg's film and offered him a directorial role on the television series. He "[had] friends that [gave him] a hard time about [the offer]. ... but doors opened when [he] stepped into the animation world," so he accepted it. He "was planning on being a starving artist": "[I spent] several thousand dollars to make a film and [realized] I may not make it back—I had loans out. Fortunately, Joe Murray saw my film ... and he took a huge chance," Hillenburg related. Hillenburg worked closely with Murray on Rocko's Modern Life for its whole run on the air. Aside from directing, he also produced, wrote and storyboarded for some episodes, and served as the executive story editor. In 1995, during the show's fourth and final season, he was promoted to creative director, where he helped oversee pre- and post-production. Working on the series enabled him to repay his loans. He later related that he "learned a great deal about writing and producing animation for TV" from his stint on Rocko's Modern Life. Some evidence shows that the idea for SpongeBob SquarePants dates back to 1986, during Hillenburg's time at the Orange County Marine Institute. He indicated that children's television series such as The New Adventures of Mighty Mouse (1987–1988) and Pee-wee's Playhouse (1986–1991) "sparked something in [him]." He continued, "I don't know if this is true for everybody else, but it always seems like, for me, I'll start thinking about something and it takes about ten years to actually have it happen, or have someone else believe in it... It took me a few years to get [SpongeBob SquarePants] together." During the production of Rocko's Modern Life, Martin Olson, one of the writers, read The Intertidal Zone and encouraged Hillenburg to create a television series with a similar concept. At that point, he had not even considered creating his own series: "After watching Joe [Murray] tear his hair out a lot, dealing with all the problems that came up, I thought I would never want to produce a show of my own." However, he realized that if he ever did, this would be the best approach: "For all those years it seemed like I was doing these two totally separate things. I wondered what it all meant. I didn't see a synthesis. It was great when [my two interests] all came together in [a show]. I felt relieved that I hadn't wasted a lot of time doing something that I then abandoned to do something else. It has been pretty rewarding," Hillenburg said in 2002. He claimed that he finally decided to create a series as he was driving to the beach on the Santa Monica Freeway one day. "It finally dawned on me that if I was going to do my own show, all those things I lectured about and obsessed about would make for an interesting world." As he was developing the show's concept, Hillenburg remembered his teaching experience at the Orange County Marine Institute and how mesmerized children were by tide-pool animals, including crabs, octopuses, starfish, and sponges. It came to him that the series should take place underwater, with a focus on those creatures: "I wanted to create a small town underwater where the characters were more like us than like fish. They have fire. They take walks. They drive. They have pets and holidays." It suited what Hillenburg liked for a show, "something that was fantastic but believable." He also wanted his series to stand out from most popular cartoons of the time exemplified by buddy comedies such as The Ren & Stimpy Show (1991–1995). As a result, he decided to focus on one main character: the weirdest sea creature that he could think of. This led him to the sponge: "I wanted to do a show about a character that was an innocent, and so I focused on a sea sponge because it's a funny animal, a strange one." In 1994, Hillenburg began to further develop some characters from The Intertidal Zone, including Bob the Sponge. Bob the Sponge is the comic's "announcer". He resembles an actual sea sponge, and at first Hillenburg continued this design because it "was the correct thing to do biologically as a marine-science teacher." In determining the new character's personality, he drew inspiration from innocent, childlike figures that he enjoyed, such as Charlie Chaplin, Laurel and Hardy, Jerry Lewis, and Pee-wee Herman. He then considered modeling the character after a kitchen sponge, and realized that this idea would match the character's square personality perfectly: "[I]t looked so funny. I think as far as cartoon language goes he was easier to recognize. He seemed to fit the character type I was looking for—a somewhat nerdy, squeaky clean oddball." To voice the central character of the series, Hillenburg turned to Tom Kenny, whose career in animation had begun with his on Rocko's Modern Life. Elements of Kenny's own personality were employed in further developing the character. In 1997, while pitching the cartoon to executives at Nickelodeon, Hillenburg donned a Hawaiian shirt, brought along an "underwater terrarium with models of the characters", and played Hawaiian music to set the theme. Nickelodeon executive Eric Coleman described the setup as "pretty amazing". Although Derek Drymon, creative director of SpongeBob SquarePants, described the pitch as stressful, he said it went "very well". Nickelodeon approved and gave Hillenburg money to produce the show. SpongeBob SquarePants was Nickelodeon's first original Saturday-morning cartoon. It first aired as a preview on May 1, 1999, and officially premiered on July 17 of the same year. Hillenburg noted that the show's premise "is that innocence prevails—which I don't think it always does in real life." It has received positive reviews from critics, and has been noted for its appeal to different age groups. James Poniewozik of Time magazine described the titular character as "the anti-Bart Simpson, temperamentally and physically: his head is as squared-off and neat as Bart's is unruly, and he has a personality to match—conscientious, optimistic and blind to the faults in the world and those around him." On the other hand, The New York Times critic Joyce Millman said that the show "is clever without being impenetrable to young viewers and goofy without boring grown-ups to tears. It's the most charming toon on television, and one of the weirdest. ... Like Pee-wee's Playhouse, SpongeBob joyfully dances on the fine line between childhood and adulthood, guilelessness and camp, the warped and the sweet." SpongeBob SquarePants was an immediate hit. Within its first month on air, it overtook Pokémon (1997–) as the highest-rated Saturday morning children's series. By the end of 2001, the show boasted the highest ratings of any children's series on television. Nickelodeon began adding SpongeBob SquarePants to its Monday-through-Thursday prime-time block. This programming change increased the number of older viewers significantly. By May 2002, the show's total viewership reached more than 61 million, 20 million of which were aged 18 to 49. Hillenburg did not expect the show would be very popular even to adults: "I never imagined that it would get to this point. When you set out to do a show about a sponge, you can't anticipate this kind of craze. We just try to make ourselves laugh, then ask if it's appropriate for children. I can tell you that we hoped it would be liked by adults. But we really thought the best we could hope for was a college audience." SpongeBob SquarePants has gone on to become one of the longest-running series on Nickelodeon. "Ten years. I never imagined working on the show to this date and this long. It never was possible to conceive that. ... I really figured we might get a season and a cult following, and that might be it," Hillenburg said in 2009 during the show's tenth anniversary. Its popularity has made it a media franchise, which is the most-distributed property of MTV Networks. As of 2015[update], it has generated $12 billion in merchandising revenue. In 2002, Hillenburg halted production of the show after the third season was completed to focus on the making of The SpongeBob SquarePants Movie which was released in 2004: "I don't want to try and do a movie and the series at the same time. We have 60 episodes and that is probably as many as [Nickelodeon] really needs. It is a standard number for a show like this. I have done a little research and people say it is just crazy doing a series and movie at the same time. I would rather concentrate on doing a good job on the movie," he noted. He directed the film from a story that he conceived with five other writer-animators from the series: Paul Tibbitt, Derek Drymon, Aaron Springer, Kent Osborne, and Tim Hill. The writers created a mythical hero's quest: the search for a stolen crown, which brings SpongeBob and his best friend Patrick to the surface. In 2003, during the production of The SpongeBob SquarePants Movie, his mentor Jules Engel died at the age of 94. Hillenburg dedicated the film to his memory. He said that Engel "truly was the most influential artistic person in [his] life." The SpongeBob SquarePants Movie grossed $140 million worldwide, and received positive reviews from critics. The review-aggregator website Rotten Tomatoes rates it 68 percent positive based on 125 reviews, with an average rating of 6.2/10. Its consensus states in summary, "Surreally goofy and entertaining for both children and their parents." "It reached to a point where I felt I'd contributed a lot and said what I wanted to say. At that point, the show needed new blood and so I selected Paul [Tibbitt] to produce. I totally trusted him. I always enjoyed the way he captured the SpongeBob character's sense of humor. And as a writer, you have to move on—I'm developing new projects." After completing the film, Hillenburg wanted to end the series "so [it] wouldn't jump the shark." "We're working on episodes 40 through 60 right now, and I always looked at that as a typical run for an animated show. [The Ren & Stimpy Show] lasted about that long, for example. And I thought now was a good time to step aside and look at a different project. I personally think it's good not to go to the point where people don't want to see your show anymore," Hillenburg said in 2002. However, Nickelodeon wanted to produce more episodes: "The show was such a cash cow for the station that it couldn't afford not to," storyboard director Sam Henderson observed. Initially Hillenburg doubted that the network would continue the show without him, saying: "I think [Nickelodeon executives] respect that my contribution is important. I think they would want to maintain the original concept and quality." Consequently, he resigned as the showrunner and appointed his trusted staff member Paul Tibbitt to the role. Although he no longer had a direct involvement producing SpongeBob SquarePants, he retained his position as an executive producer and maintained an advisory role, reviewing each episode. While he was on the show, he voiced Potty the Parrot and sat in with Derek Drymon at the record studio to direct the voice actors while they were recording. During the fourth season, Tibbitt took on voicing for Potty, while Andrea Romano replaced the two as the voice director. In 2014, Tibbitt announced on his Twitter account that Hillenburg would return to the show. However, he did not specify what position the former showrunner would hold. As early as 2012, Hillenburg had already been contributing to another film based on the series, which was first reported in 2011 and officially announced the following year, with Tibbitt as director. Tibbitt also wrote the story with Hillenburg, who "[had] been in the studio everyday working with [the crew]." Besides writing, Hillenburg also executive produced. He said in 2014: "Actually when [the film] wraps, I want to get back to the show. ... it is getting harder and harder to come up with stories. So Paul [Tibbitt] and I are really going to brainstorm and come up with fresh material." Called The SpongeBob Movie: Sponge Out of Water, the second film adaptation was released in 2015 to positive critical reception, currently holding a Rotten Tomatoes approval rating of 80 percent and an average rating of 6.5/10. It earned $323.4 million worldwide, becoming the second highest-grossing film based on an animated television show, behind The Simpsons Movie (2007). Despite its widespread popularity, SpongeBob SquarePants has been involved in public controversies. In 2005, a promotional video showing SpongeBob and other characters from children's shows singing together to promote diversity and tolerance was attacked by an evangelical group because they saw SpongeBob as being used to "advocate homosexuality". James Dobson of Focus on the Family accused the video of promoting homosexuality, because it was sponsored by a pro-tolerance group. The incident prompted questions as to whether SpongeBob is gay. Although the character has enjoyed popularity with gay viewers, Hillenburg had already denied this in 2002, clarifying at the time that he considers the character "somewhat asexual". After Dobson's comments, Hillenburg reasserted his position, stating that sexual preference does not play a part in what they are "trying to do" with the series. Dobson later stated that his comments were taken out of context, and that his original complaints were not with SpongeBob, the video, or any of the characters in the video, but rather with the organization that sponsored the video, the We Are Family Foundation. In 1998, Hillenburg formed United Plankton Pictures, a television and film production company, which produces SpongeBob SquarePants and related media. From 2011 to 2018, the company published SpongeBob Comics, a comic-book series based on the cartoon. 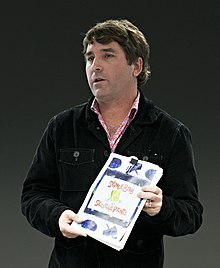 Hillenburg announced the venture in a 2011 press release, where he said, "I'm hoping that fans will enjoy finally having a SpongeBob comic book from me." Various cartoonists, including James Kochalka, Hilary Barta, Graham Annable, Gregg Schigiel, and Jacob Chabot, have contributed to issues of the comic. According to Jeff Lenburg, in his book Who's Who in Animated Cartoons, Hillenburg was co-writing and co-directing a second animated feature film based on Rob Zombie's comic-book series, The Haunted World of El Superbeasto, which was slated for a 2006 release. He helped to write Diggs Tailwagger, a 2007 pilot by Derek Drymon. Hillenburg stated in 2009 that he was developing two other television projects that he did not want to discuss. In 2010, he began working on Hollywood Blvd., USA, a new short film for animation festivals. In making the two-minute film, he videotaped people walking and animated them in walk cycles. Hillenburg said in 2012, "I hope to get [the film] done. It takes forever." He was aiming to finish it that fall. In 2013, three years after production began, Hollywood Blvd., USA was released to festivals. Hillenburg characterized it as a "personal film" and said that "it's not a narrative. It's just really about people in our town." Hillenburg married Karen (née Umland), a Southern Californian chef who teaches at the New School of Cooking in Culver City, in 1998. Hillenburg deemed her to be the funniest person that he knew. That same year, the couple's first and only child, son Clay, was born. Hillenburg formerly resided in Hollywood and in Pasadena, and lived with his family in San Marino, California until his death. His hobbies included surfing, snorkeling, scuba diving, and performing "noisy rock music" on his guitar. He jammed with his son, who is a drummer, which Hillenburg called "a great way to bond with each other." He also enjoyed birdwatching at home, but said that he was always "an ocean freak". He was known informally as "Steve" among his family, friends, and fans. According to his colleagues, Hillenburg was "a perfectionist workaholic". He was also known for his private nature. Julia Pistor, co-producer of The SpongeBob SquarePants Movie, noted that Hillenburg was "very shy". She went on to say, "He doesn't want people to know about his life or family. He's just a really funny, down-to-earth guy with a dry sense of humor who puts his family first and keeps us on our toes in keeping our corporate integrity." Hillenburg said about himself, "I make animation because I like to draw and create things. I have no real interest to be on camera or to be a celebrity. It's not that I don't like people, but I like having my privacy." Hillenburg, with his wife Karen, had endowed numerous projects and organizations through the United Plankton Charitable Trust, which the couple established in 2005. The foundation, whose name was adopted from Hillenburg's United Plankton Pictures, supports areas of the two's personal interest, giving under $500,000 annually as of 2017[update]. Grantees include large, established arts-related organizations such as the Los Angeles County Museum of Art and the Society for the Activation of Social Space through Art and Sound, in which Karen is co-chair. Health accounts for most of their grantmaking; they had gifted to Planned Parenthood (where Karen is member of the board of directors as of 2014[update]) and the National Multiple Sclerosis Society, among other national health organizations. In education, they had invested to schools, including the Polytechnic School in Pasadena (which their son attended), CalArts, and the Humboldt State University. Donations to the latter helped fund the HSU Marine Lab and the Stephen Hillenburg Marine Science Research Award Endowment, which the couple created in 2018 to support the university's marine-science research students. The previous year, the Princess Grace Foundation introduced the Stephen Hillenburg Animation Scholarship, an annual grant from the Hillenburgs to emerging animators. 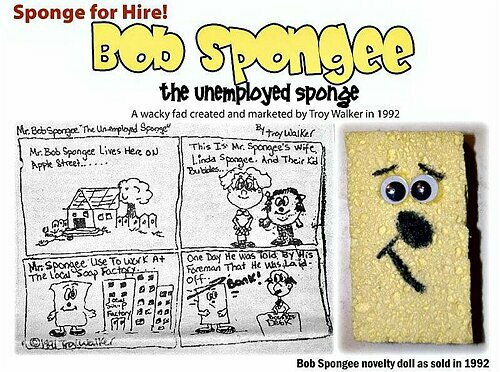 In 2007, cartoonist Troy Walker sued Hillenburg, whom he claimed stole the idea for the SpongeBob SquarePants character from his 1991 comic strip, Bob Spongee, the Unemployed Sponge, and the eponymous homemade doll. In his original concept, Walker drew a face on a kitchen sponge and attached googly eyes. He produced approximately 1,000 of the "drawn-on" dolls. Walker then placed those models in clear plastic bags that included the comic strip, and sold them at flea markets in the San Francisco Bay Area in 1992. He also placed an advertisement in the Oakland Tribune, selling fewer than 20 dolls. After learning about SpongeBob SquarePants in 2002, Walker concluded, "It obviously fell into the hands of one of the producers of the show. It's a clear pattern of duplication." He did not register the comic strip with the U.S. Copyright Office until 2003. Walker also filed the lawsuit against Nickelodeon, Paramount Pictures (the distributor of The SpongeBob SquarePants Movie), and Viacom (their parent company) in a U.S. district court in San Francisco. He demanded $1.6 billion in damages, alleging that Hillenburg used his idea without his permission. Walker added in his complaint, "It is more than ironic that two working class sponges are named Bob. Both characters are unemployed. Both characters live in a house concept," referring to "Help Wanted" (the pilot episode of SpongeBob SquarePants) which, he supposed, "represents an obvious continuum from the last scene of the Bob Spongee comic strip." In a public statement, Viacom said that they believed Walker's claim was "baseless". A settlement conference, filed on May 13, 2008, was conducted at the Northern District Federal Court in San Francisco. The matter was dropped before trial after the court granted the defendants' motion for summary judgment. Hillenburg disclosed to Variety magazine in March 2017 that he had been diagnosed with amyotrophic lateral sclerosis (ALS), a terminal illness that affects and causes the death of neurons that control the brain and the spinal cord. He released a statement to the publication, in which he said that he would continue to work on SpongeBob SquarePants "for as long as [he is] able." He added: "My family and I are grateful for the outpouring of love and support. We ask that our sincere request for privacy be honored during this time." Hillenburg was in the early stages of the disease at the time, according to a source close to him. Hillenburg died at his home on November 26, 2018, at the age of 57. The immediate cause of death was cardiopulmonary failure due to ALS. He was cremated and his ashes were scattered in the Pacific Ocean at least 500 yards (460 m) off the coast of California the following day. During the halftime show for Super Bowl LIII, the performing band Maroon 5 arranged to use a clip from the SpongeBob episode "Band Geeks" (which uses the song "Sweet Victory" as part of a spoof of a football halftime show) during their show as a means to pay tribute to Hillenburg's passing. A full clip of the "Sweet Victory" song, including a dedication to Hillenburg, was played inside Mercedes-Benz Stadium, but not during the game, which disappointed many people. 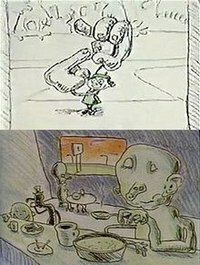 In 1992, one of Hillenburg's early works, Wormholes, won for Best Concept at the Ottawa International Animation Festival. For SpongeBob SquarePants, Hillenburg was nominated for 17 Emmy Awards, winning in the categories of Outstanding Special Class Animated Program and Outstanding Sound Editing – Animation in 2010 and 2014, respectively. The show has also received several other awards and nominations, including 17 Annie Award nominations, winning six times, as well as winning two British Academy Children's Awards, out of four nominations. In 2002, SpongeBob SquarePants won its first TCA Award for Outstanding Achievement in Children's Programming nomination. In 2001, Heal the Bay, an environmental nonprofit organization, honored Hillenburg with its Walk the Talk award. He was recognized for raising public awareness of marine life through SpongeBob SquarePants. The following year, Hillenburg was given the Television Animation Award from the National Cartoonists Society, and the Princess Grace Statue Award from the Princess Grace Foundation. In 2018, Hillenburg received the Winsor McCay Award at the 45th Annie Awards, and a special recognition at the 45th Daytime Emmy Awards "for his contribution and impact made in the animation field and within the broadcast industry." ^ Schudel, Matt (November 27, 2018). "'SpongeBob SquarePants' creator Stephen Hillenburg dies at 57". The Washington Post. Nash Holdings. Retrieved December 10, 2018. ^ a b c d e f g h i j k l m n o p q r s t u v w x y z aa ab ac ad ae af ag ah K.E.D. (April 2003). "Cover Biography for April 2003". Current Biography. Archived from the original on August 14, 2011. Retrieved December 20, 2013. ^ a b c d Staff writer(s); no by-line. (September 25, 2008). "Kelly N. Hillenburg Jr". Bangor Daily News. Islesford and Morro Bay, California: Bangor Publishing Company. Archived from the original on February 24, 2016. Retrieved November 20, 2016. ^ a b c d e f g h i j k l m n o p q r s t u v w x y z aa ab ac ad ae af ag ah ai aj ak al am an ao ap aq ar as at au av aw Wilson, Tom (interviewer); Hillenburg, Stephen (interviewee) (May 29, 2012). Big Pop Fun #28: Stephen Hillenburg, Artist and Animator–Interview (mp3) (Podcast). Nerdist Industries. Archived from the original on December 21, 2013. Retrieved December 21, 2013. ^ a b c Staff writer(s); no by-line. (October 15, 2001). "It's Hip To Be Square". The Washington Post. Nash Holdings. Archived from the original on February 12, 2017. Retrieved January 9, 2017. ^ a b c d e f g h i j k l m Staff writer(s); no by-line. (April 25, 2014). "Happy Birthday SpongeBob SquarePants!". Princess Grace Foundation-USA. Archived from the original on December 30, 2016. Retrieved December 27, 2016. ^ a b c d e f g h i j k l Cavna, Michael (July 14, 2009). "The Interview: 'SpongeBob' Creator Stephen Hillenburg". The Washington Post. Nash Holdings. Retrieved May 25, 2013. ^ a b c Gates, Anita (October 27, 1997). "Television / Radio; The Tide Pool as Talent Pool (It Had to Happen)". The New York Times. Archived from the original on June 12, 2008. Retrieved April 26, 2008. ^ a b c d e f g h i j k l m "Walker v. Viacom ND Cal May 2008" (PDF). United States District Court for the Northern District of California. May 13, 2008. Archived from the original (PDF) on April 5, 2012. Retrieved January 12, 2014. ^ a b c Cochrane, Myles (June 28, 2011). "Famous Humboldt: From the redwoods to the limelight". Ukiah Daily Journal. Digital First Media. Archived from the original on March 9, 2016. Retrieved December 22, 2013. ^ "About the Institute". Ocean Institute. Archived from the original on December 18, 2015. Retrieved December 24, 2013. ^ Levine, Bettijane (April 13, 2002). "Hip To Be Square". Sun-Sentinel. Tronc. Archived from the original on January 10, 2017. Retrieved January 9, 2017. ^ a b c d e f g h i j k l Hillenburg, Stephen; Murray, Joe; Drymon, Derek; Coleman, Eric; Hecht, Albie (2003). The Origin of SpongeBob SquarePants. SpongeBob SquarePants: The Complete First Season (DVD). Paramount Home Entertainment. ^ Baisley, Sarah (September 11, 2003). "Jules Engel Tribute". Animation World Network. Archived from the original on December 29, 2016. Retrieved December 28, 2016. ^ a b c Street, Rita (September 8, 2003). "Jules Engel, Mentor & Inspired Artist Passes". Animation Magazine. Archived from the original on December 29, 2016. Retrieved December 28, 2016. ^ a b Dargis, Manohla (May 21, 2006). "CalArts: The School With Antz in Its SquarePants". The New York Times. Archived from the original on December 29, 2016. Retrieved December 28, 2016. ^ a b "Memorable Quotes". Jules-Engel. Archived from the original on October 25, 2016. Retrieved January 1, 2017. ^ a b "Visualizing Art History: Experimental Animation & Its Mentor, Jules Engel". Indiegogo. Archived from the original on September 21, 2013. Retrieved August 18, 2013. ^ a b Lieberman, Paul (May 21, 2006). "CalArts gets its close-up". Los Angeles Times. Tronc. Archived from the original on December 29, 2016. Retrieved December 28, 2016. ^ a b c d e Staff writer(s); no by-line. (2003). "PGF-USA Newsletter: SpongeBob's Dad Tells All" (PDF). Princess Grace Foundation-USA. Archived (PDF) from the original on September 18, 2013. Retrieved January 12, 2014. ^ "Princess Grace Foundation-USA Mission Statement". Princess Grace Foundation-USA. Archived from the original on November 29, 2016. Retrieved January 10, 2017. ^ a b "Stephen Hillenburg". Princess Grace Foundation-USA. Archived from the original on December 21, 2013. Retrieved December 21, 2013. ^ "Kids Showcase". Ottawa International Animation Festival. 2005. Archived from the original on January 5, 2017. Retrieved January 5, 2017. ^ a b "Ottawa International Animation Festival 1992 Edition (September 29-October 4, 1992)". Ottawa International Animation Festival. 1992. Archived from the original on May 26, 2012. Retrieved December 26, 2013. ^ a b "1992 Ottawa International Animation Festival". Ottawa International Animation Festival. Archived from the original on September 24, 2015. Retrieved December 20, 2013 – via Internet Movie Database. ^ Stringer, Ron (June 21, 2006). "Calarts in Moving Pictures: A Mini Tribute". LA Weekly. Voice Media Group. Archived from the original on December 28, 2016. Retrieved December 28, 2016. ^ a b c d Shattuck, Kathryn (July 29, 2001). "For Young Viewers; For This Scientist, Children Are Like, er, Sponges". The New York Times. Archived from the original on February 2, 2017. Retrieved January 22, 2017. ^ Moss, Alexandra B. (November 19, 2004). "'Sponge' Creator Talks Bob". The Harvard Crimson. Archived from the original on October 7, 2012. Retrieved July 19, 2011. ^ a b c d Heintjes, Tom (September 21, 2012). "The Oral History of SpongeBob SquarePants". Hogan's Alley (17). Archived from the original on August 31, 2015. Retrieved August 28, 2015. ^ Orlando, Dana (March 17, 2003). "SpongeBob: the excitable, absorbent star of Bikini Bottom". St Petersburg Times. Times Publishing Company. Archived from the original on December 19, 2008. Retrieved November 8, 2008. ^ Farhat, Basima (interviewer) (December 5, 2006). Tom Kenny: Voice of SpongeBob SquarePants – Interview (Radio production). The People Speak Radio. Archived from the original (mp3) on July 24, 2011. Retrieved November 8, 2008. ^ "TV People Series: Home & Garden; TV People". St. Petersburg Times. Times Publishing Company. May 1, 1999. Retrieved March 28, 2010. ^ Poniewozik, James (December 9, 2011). "Soaking Up Attention". Time. Archived from the original on December 29, 2013. Retrieved December 27, 2013. ^ Millman, Joyce (July 8, 2001). "Television/Radio; The Gentle World Of a Joyful Sponge". The New York Times. Archived from the original on January 15, 2014. Retrieved December 27, 2013. ^ Huff, Richard (December 14, 2009). "'SpongeBob SquarePants' one of Nickelodeon's longest-running shows after nearly a decade". New York Daily News. Daily News. Archived from the original on January 21, 2013. Retrieved December 15, 2013. ^ Stock, Rosina (June 24, 2009). "Nickelodeon Celebrates Pop Culture Icon SpongeBob SquarePants decade". Media News International. Archived from the original on June 26, 2009. Retrieved July 14, 2009. ^ Gillette, Felix (January 29, 2015). "SpongeBob Muscles Up". Bloomberg Businessweek. Archived from the original on April 7, 2017. Retrieved December 30, 2016. ^ a b Koltnow, Barry (November 14, 2004). "SpongeBob creator is soaking up success". East Valley Tribune. Times Media Group. Archived from the original on February 8, 2016. Retrieved June 16, 2013. ^ Edelstein, David (November 7, 2004). "He Lives in a Pineapple, but Then What?". The New York Times. Burbank, California. p. 1. Archived from the original on December 20, 2013. Retrieved August 19, 2013. ^ Edelstein, David (November 7, 2004). "He Lives in a Pineapple, but Then What?". The New York Times. Burbank, California. p. 2. Archived from the original on February 14, 2015. Retrieved August 19, 2013. ^ Holland, Steve (September 17, 2003). "Jules Engel". The Guardian. Guardian Media Group. Archived from the original on December 24, 2013. Retrieved December 21, 2013. ^ Amidi, Amid (November 28, 2004). "More Thoughts on the SpongeBob Movie". Cartoon Brew. Archived from the original on September 21, 2013. Retrieved August 18, 2013. ^ "The SpongeBob SquarePants Movie (2004)". Box Office Mojo. Internet Movie Database. Archived from the original on August 24, 2009. Retrieved July 20, 2009. ^ "The Spongebob Squarepants Movie (2004)". Rotten Tomatoes. Flixster. Archived from the original on July 25, 2010. Retrieved July 9, 2010. ^ a b Henderson, Sam (September 21, 2012). "The Oral History of SpongeBob SquarePants". Hogan's Alley (17). Archived from the original on August 31, 2015. Retrieved August 28, 2015. ^ a b c Bauder, David (July 13, 2009). "SpongeBob Turns 10 Valued At $8 Billion". The Huffington Post. AOL. Archived from the original on July 17, 2009. Retrieved May 22, 2013. ^ Fletcher, Alex (April 3, 2011). "Paul Tibbitt ('SpongeBob SquarePants')". Digital Spy. Hearst Communications. Archived from the original on February 2, 2016. Retrieved May 25, 2013. ^ Hillenburg, Stephen (2009). The First 100 Episodes - Square Roots: The Story of SpongeBob SquarePants (DVD). Paramount Home Entertainment. ^ Staff writer(s); no by-line. (July 13, 2009). "Nickelodeon's 'SpongeBob SquarePants' Reaches A Milestone: 10 Years". Associated Press. Archived from the original on February 8, 2016. Retrieved May 25, 2013 – via Access Hollywood, KNBC. ^ SpongeBob SquarePants: The Complete 2nd Season (DVD). United States: Paramount Home Entertainment/Nickelodeon. October 19, 2004. ^ a b c Hammond, Jennie Monica (September 21, 2012). "The Oral History of SpongeBob SquarePants". Hogan's Alley (17). Archived from the original on August 31, 2015. Retrieved August 28, 2015. ^ SpongeBob SquarePants: Friend or Foe ("Friend or Foe" credits) (DVD). United States: Paramount Home Entertainment/Nickelodeon. April 17, 2007. ^ Amid Amidi (December 13, 2014). "'SpongeBob' Creator Stephen Hillenburg Returning to His Show". Cartoon Brew. Archived from the original on December 14, 2014. Retrieved December 17, 2014. ^ Fritz, Ben; Verrier, Richard (March 4, 2011). "Success for Paramount's 'Rango' could lead to end of deal with DreamWorks". Los Angeles Times. Tronc. Archived from the original on November 14, 2012. Retrieved March 26, 2014. ^ Miller, Daniel (February 28, 2012). "Paramount to Release 'SpongeBob' Movie in Late 2014". The Hollywood Reporter. Prometheus Global Media. Archived from the original on March 1, 2012. Retrieved February 28, 2012. ^ a b McLean, Tom (February 21, 2015). "SpongeBob Gets Real". Animation Magazine. Archived from the original on February 2, 2017. Retrieved January 22, 2017. ^ a b Tibbitt, Paul (December 19, 2013). "@DEEninetysix @shawndagamer ." Archived from the original on December 21, 2013. Retrieved December 21, 2013 – via Twitter. ^ a b Graser, Marc; Kroll, Justin (August 16, 2012). "Paramount ramping up animation slate". Variety. Penske Media Corporation. Archived from the original on October 14, 2013. Retrieved August 17, 2012. ^ Sneider, Jeff (June 5, 2014). "Paramount Avoids 'Fifty Shades' by Moving Up 'SpongeBob SquarePants' Sequel". TheWrap. Archived from the original on June 6, 2014. Retrieved June 7, 2014. ^ "The SpongeBob Movie: Sponge Out of Water (2015)". Rotten Tomatoes. Flixster. Archived from the original on February 8, 2016. Retrieved February 11, 2016. ^ "The SpongeBob Movie: Sponge Out of Water (2015)". Box Office Mojo. Internet Movie Database. Archived from the original on May 23, 2015. Retrieved May 26, 2015. ^ "Animation - TV Adaption Movies at the Box Office - Box Office Mojo". Box Office Mojo. Internet Movie Database. Archived from the original on March 16, 2015. Retrieved March 17, 2015. ^ a b Staff writer(s); no by-line. (January 22, 2005). "Spongebob, Muppets and the Sister Sledge writer suffer criticism". New York. Associated Press. Archived from the original on October 22, 2012. Retrieved June 11, 2007 – via USA Today. ^ Staff writer(s); no by-line. (January 20, 2005). "US right attacks SpongeBob video". BBC News. Archived from the original on March 23, 2007. Retrieved June 11, 2007. ^ Staff writer(s); no by-line. (October 9, 2002). "Camp cartoon star 'is not gay'". BBC News. Archived from the original on June 25, 2006. Retrieved June 11, 2007. ^ Silverman, Stephen M. (January 28, 2005). "SpongeBob Asexual, Not Gay: Creator". People. Archived from the original on October 29, 2016. Retrieved August 26, 2009. ^ Staff writer(s); no by-line. (January 29, 2005). "SpongeBob isn't gay or straight, creator says". Reuters. Archived from the original on February 3, 2005. Retrieved November 9, 2008 – via Independent Online. ^ Chang, Pauline J. (January 28, 2005). "Dobson clarifies Pro-Gay SpongeBob Video Controversy". The Christian Post. Archived from the original on July 21, 2012. Retrieved May 9, 2018. ^ "Business Search". California Secretary of State. Archived from the original on December 29, 2016. Retrieved March 9, 2014. ^ a b c Boom, Richard (January 25, 2011). "SpongeBob Comics #1 debuts from United Plankton Pictures". Broken Frontier. Archived from the original on January 28, 2011. Retrieved December 6, 2013. ^ a b c Staff writer(s); no by-line. (January 25, 2011). "'SpongeBob SquarePants' Comic Debuts in February". Comic Book Resources (Press release). Archived from the original on January 13, 2017. Retrieved December 6, 2013. ^ "Diggs Tailwagger (2007 Cartoon Network pilot)". February 21, 2016. Retrieved June 2, 2018 – via YouTube. ^ Brian B. (February 16, 2006). "Nickelodeon Greenlights Super Scout & Diggs Tailwagger". Movieweb. Retrieved June 2, 2018. ^ a b "Hollywood Blvd, USA". Holland International Film Festival. Archived from the original on January 1, 2017. Retrieved December 31, 2016. ^ Staff writer(s); no by-line. (January 2001). "To Love & Die in L.A." Los Angeles Magazine. Emmis Communications. p. 138. ISSN 1522-9149. Retrieved September 22, 2018. ^ a b "Board of Directors". Society for the Activation of Social Space through Art and Sound. Archived from the original on April 20, 2018. Retrieved December 18, 2018. ^ a b c Otterson, Joe (November 27, 2018). "'SpongeBob Squarepants' Creator Stephen Hillenburg Dies at 57". Variety. Archived from the original on December 1, 2018. Retrieved November 26, 2018. ^ Hayward, Anthony (November 29, 2018). "Stephen Hillenburg obituary". The Guardian. Retrieved November 30, 2018. ^ a b c d e f "Stephen and Karen Hillenburg". Inside Philanthropy. Retrieved December 16, 2018. ^ a b Genzlinger, Neil (November 27, 2018). "Stephen Hillenburg, 'SpongeBob SquarePants' Creator, Dies at 57". The New York Times. Retrieved December 12, 2018. ^ a b Murphy, Kate (June 15, 2013). "Stephen Hillenburg". The New York Times. Archived from the original on November 20, 2016. Retrieved December 20, 2013. ^ a b c d Adeniji, Ade (March 16, 2017). "In Plankton We Trust: How Spongebob's Creator Does His Philanthropy". Inside Philanthropy. Retrieved December 16, 2018. ^ "United Plankton Charitable Trust". Foundation Center. Retrieved December 16, 2018. ^ Thompson, D. L. (November 27, 2018). "Stephen Hillenburg Family: 5 Fast Facts You Need to Know". Heavy.com. Retrieved December 16, 2018. ^ Santos, Philip (September 6, 2018). "'SpongeBob SquarePants' creator gives back to HSU". Times-Standard. Digital First Media. Retrieved December 16, 2018. ^ Giardina, Carolyn (October 24, 2017). "Princess Grace Foundation Launches Animation Scholarship". The Hollywood Reporter. Eldridge Industries. Retrieved June 2, 2018. ^ a b c d e f g Gerstman, Bruce (March 10, 2007). "Fairfield man claims rights to SpongeBob". East Bay Times. Digital First Media. Archived from the original on September 12, 2016. Retrieved January 12, 2014. ^ a b c Staff writer(s); no by-line. (March 10, 2007). "Man Claims He Created Original SpongeBob". San Francisco, California. Associated Press. Archived from the original on January 12, 2014. Retrieved January 12, 2014 – via ABC. ^ a b c Staff writer(s); no by-line. (March 13, 2007). "Man Sues for $1.6 Billion Over Rights to Sponge Bob Square Pants". Contra Costa Times. Digital First Media. Archived from the original on January 12, 2014. Retrieved January 12, 2014 – via Insurance Journal, Merchants Insurance Group. ^ Wallenstein, Andrew (March 13, 2017). "'SpongeBob SquarePants' Creator Stephen Hillenburg Reveals ALS Diagnosis". Variety. Archived from the original on March 14, 2017. Retrieved March 14, 2017. ^ a b "'SpongeBob SquarePants' creator death cert reveals ashes spread under the sea". TMZ. December 6, 2018. ^ Galbraith, Alex (December 7, 2018). "'SpongeBob SquarePants' Creator's Ashes Fittingly Scattered at Sea". Complex. Retrieved December 7, 2018. ^ Alexander, Julia (February 3, 2019). "Spongebob Squarepants' 'Sweet Victory' finally gets a Super Bowl tribute". The Verge. Retrieved February 3, 2019. ^ "Division Awards". National Cartoonists Society. Archived from the original on July 26, 2014. Retrieved December 21, 2013. ^ Giardina, Carolyn (February 1, 2018). "Annie Awards: THR's Guide to the Animated Film Ceremony". The Hollywood Reporter. Eldridge Industries. Retrieved June 2, 2018. ^ Amidi, Amid (April 30, 2018). "'Spongebob' Creator Stephen Hillenburg Honored With Special Emmy Award". Cartoon Brew. Retrieved June 2, 2018. ^ Brownlee, Shannon (2011). "Shannon Brownlee – Masculinity Between Animation and Live Action, or, SpongeBob v. Hasselhoff" (PDF). Animation Studies. 6. Archived (PDF) from the original on February 2, 2017. Retrieved January 22, 2017. ^ Alter, Ethan (November 16, 2004). "The SpongeBob SquarePants Movie". Film Journal International. Archived from the original on February 2, 2017. Retrieved January 22, 2017. ^ a b "Stephen Hillenburg". The Numbers. Archived from the original on February 2, 2017. Retrieved January 22, 2017. ^ Drymon, Derek (September 21, 2012). "The Oral History of SpongeBob SquarePants". Hogan's Alley (17). Archived from the original on August 31, 2015. Retrieved August 28, 2015. ^ SpongeBob SquarePants: 10 Happiest Moments (DVD). Paramount Home Entertainment. 2010. ^ SpongeBob SquarePants: The Complete 3rd Season (DVD). Paramount Home Entertainment. 2005. ^ Hinckley, David (July 13, 2009). "'SpongeBob SquarePants' gets closer look on VH1 with 10th anniversary documentary on Nickelodeon hit". New York Daily News. Daily News. Archived from the original on October 13, 2016. Retrieved January 22, 2017. Abbey, Cherie D., ed. (2004). Biography Today: Profiles of People of Interest to Young Readers. Author Series. 14. Omnigraphics. ISBN 978-0-7808-0652-8. Banks, Steven (September 21, 2004). SpongeBob Exposed! The Insider's Guide to SpongeBob SquarePants. Illustrated by Gregg Schigiel. Simon Spotlight/Nickelodeon. ISBN 978-0-689-86870-2. Lenburg, Jeff (2006). Who's Who in Animated Cartoons: An International Guide to Film and Television's Award-Winning and Legendary Animators (Illustrated ed.). Hal Leonard Corporation. ISBN 978-1557836717. Neuwirth, Allan (2003). Makin' Toons: Inside the Most Popular Animated TV Shows and Movies (Illustrated ed.). Allworth Press. ISBN 978-1-58115-269-2.